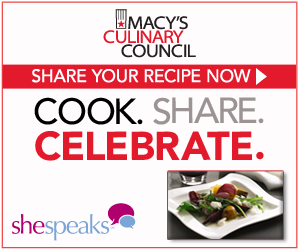 Have you heard about the Macy’s Recipe Share Contest? SheSpeaks asked me to help them spread the word about this fun contest; between November 1 and 30th, you can enter your favorite fall recipe and vote on recipes submitted by others. Established in 1858, Macy’s is the Great American Department Store; it’s an iconic retail brand with over 800 stores across the country and online at macys.com. 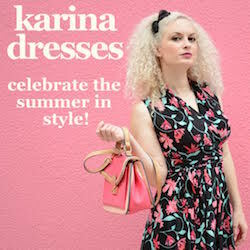 Macy’s offers an incredible selection and the very best brands, tailored to each and every customer, while providing an experience that transcends ordinary shopping. It really is my favorite place to shop – especially during the holidays! A big part of Macy’s unique heritage includes special events like the Macy’s Thanksgiving Day Parade and holiday traditions that range from the arrival of Santa Claus to tree lightings and their famous festive window displays. But beyond signature events, also Macy’s delivers magical moments every day through their shopping environment, service and merchandise . It’s all part of the excitement they’ve been creating for 151 years, and it’s all part of the magic of Macy’s! It’s easy to enter, and you could win $1,000 and have your recipe featured on Food Republic! What are you waiting for? SheSpeaks will also be having a Twitter party, make sure you RSVP to attend – it’s a great way to learn more about the contest, and about how Macy’s and SheSpeaks have teamed up to share your favorite Holiday recipes through the Macy’s Recipe Share Contest. *I received a promotional item to thank me for sharing this information. All opinions are my own – I love Macy’s! If nothing else, there would be lots of good recipes to find there, huh? I am going to have to check this out! I love Macy’s and good recipes! I am always looking for new recipes. Hi, when I saw your Twitter page, I liked your name, so I decided to just check you out. I agree with you on trying everything once. Someone says, rather be sorry for the things you have done, than the things you havent. Obviously within the law. Have a super week, and hope you get enough sleep! I love Macy’s, too! &Christmas officially starts for me when Santa drives by in the parade on Thanksgiving! The prize is great, and there will be lots of great new recipes to check out..thanks! Sounds like a great twitter Party! I love Macy’s too and who couldn’t use some moola!